Next Meeting: Wednesday, March 14, 2018, 6:30 p.m. – 8:00 p.m.
Join us as we plumb the depths of tunnel book structures in a member-led mini workshop format similar to our ever-popular November program, Card Tricks and Book Blitz. Bring a tunnel book you’ve made, or a model of a tunnel book structure you’ve put together, along with materials that will allow approximately six people to make a model of your structure. If you can, bring written instructions for making the model – strictly optional and extra credit, but always appreciated! Each person who brings a book or model will have some time to share and explain what they’ve made to the group, then we’ll spend time individually exploring and creating the structures. Please feel free to join in the fun even if you don’t have time to prepare a model tunnel book or materials. We use a similar meeting format every November and there is always enough to go around. Warning: Tunnel book structures are addictive, and B.A.G. cannot be held responsible for other projects that may not get done once you discover the many techniques available for making these magical books! Perhaps it was Jill’s enticing program description, Mining for Gold – Exploring Tunnel Books, that brought so many people out to the January meeting! After an inspiring slide show of tunnel books from the web (thanks, Ann! ), many makers shared their tunnel creations. While the variety of style and subject seemed broad, the overall concept of how image and construction form the tunnel was clear. It’s always amazing to hear members talk about their work, and to realize what a talented bunch we are. Thanks to everyone who came, participated, and enjoyed. *** Book Arts Guild of Vermont 2018 Show news! Submissions: Work must be submitted by May 1, 2018. No work can be accepted after that date. The second show will take place in June at Frog Hollow Craft Gallery on Church Street. This will be a great opportunity to get exposure for our group in the heart of Burlington. The show will be called The Art of the Book, which leaves it wide open to interpretation. Submissions: Work must be submitted by May 22, 2018. No work can be accepted after that date. In this workshop, you will make 3 or more books using simple techniques. You will also have time to fill the pages of your books with words, images, color, and all manner of collage material provided! This workshop is for ages 18+ and all materials will be provided. ​Jane will be co-teaching these workshops with Lily Hinrichsen. The workshop is being taught twice, so you can attend either on March 23rd or March 24th. The workshops are being held at ARTSight in Bristol from 10:00 a.m. – 3:00 p.m. and cost $70.00 (or $60.00 if you’ve taken our workshops before). For more information, contact Lily at lilyhinrichsen@gmail.com. Learn how to sew beautiful single and multiple-signature book bindings. Learn about some of the tools and techniques and how to make informed material choices. The workshop’s focus will be on form and structure. Students will leave with three different sewn softcover bindings. Some bookbinding experience is helpful but not necessary. The workshop is taking place at the Middlebury Studio School on Saturday, March 31st from 9:30 a.m. – 12:30 p.m.The cost is $55.00, which includes all materials and handouts. For more information or to register, contact Barb Nelson at (802) 247-3702 or ewaldewald@aol.com. *** B.A.G. member Elissa Campbell is teaching the Crossed Structure Binding at Studio Place Arts in Barre, VT on March 24th from 10:00 a.m. – 3:00 p.m. The Crossed Structure Binding is intriguing in that the sewing is done directly onto back cover straps that integrate into the front cover. This non-adhesive variation on the long stitch was developed by book artist Carmencho Arregui after studying pre-16th century bindings. 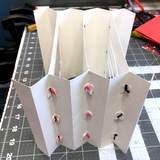 In this workshop, you will work on two variations of this binding, one using paper covers and the other using leather. As time allows, you’ll add stitching to the covers to both reinforce the structure and add a decorative touch. You’ll also learn how to create and use an improvised sewing frame. To register, contact SPA via phone at (802) 479-7069 or email. *** The New England Chapter of the Guild of Book Workers is looking for volunteers to help teach simple bookbinding techniques and creative content. Through this event, NEGBW volunteers will be helping Cadette scouts (age 11-14) to earn a Book Artist badge and potentially inspiring future bookbinders. The event will be held on Sunday April 29, 2018 at Camp Maude Eaton in Andover, MA. There will be two sessions, one from 9:00 a.m. – 12:00 p.m. and from 1:00 p.m. – 3:00 p.m. If you are interested in volunteering or have any questions, please direct them at Lauren Telepak at negbwprograms@gmail.com. *** From February 17 – July 8, the Philadelphia Museum of Art is hosting the exhibition Keith Smith at Home. This is a rare opportunity to view the creative work of the well-known author of such a beloved series of bookbinding manuals. Friendship, love, desire: Keith Smith’s life is an open book. For five decades, the Rochester-based artist has used surprising combinations of materials to chronicle his experiences. In this exhibition, explore an array of Smith’s mixed-media photographs and prints, and – his specialty – handmade artist’s books, most from his own collection. For more information, please visit the PMA’s website. 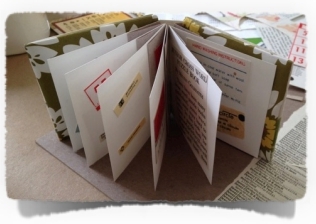 *** On Saturday, April 28th, the Kate Cheney Chappell 83 Center for Book Arts is hosting a workshop with Erin Fletcher of Herringbone Bindery, Secret Belgian Binding – Two Ways. The workshop will be held in the Multi-Purpose Room in the Wishcamper Center at the University of Southern Maine in Portland. Registration is available online or alternatively, you can call (207) 780-5900. *** From June 11 – 15, the North Bennet Street School is offering Miniature Bookbindings with James Reid-Cunningham. Miniature books present difficult design and structural challenges to the bookbinder. A true miniature is less than three inches tall, and during this course, the student will construct three books of diminishing size: a long stitch binding with decorated boards, a lapped component binding, and an accordion in a wrapper with a tongue and slot enclosure. The course will contrast the utility of case binding, accordion, and non-adhesive structures for miniature books, with a concentration on flexibility and book action. We will analyze materials and techniques suitable for small format books. The limitations inherent in small-scale books will challenge students to do precisely executed and finely detailed work. *** Registration for Wells College Book Arts Center‘s Book Arts Summer Institute is now open. The week-long intensive courses include letterpress printing, bookbinding, calligraphy, typecasting, and font design. Week 1 runs from July 15 – 21 and Week 2 runs from July 22 – 28. This year’s instructors include Jenna Rodriguez, Aimee Lee, and Scott McCarney. Wells College is located in Aurora, NY. For more information, please visit the Wells College website. Ann will also have postcards from the Summer Institute available at the February meeting.